He took the lap of elevation last Saturday night at the West St George Secondary School, when the 2014 edition closed off. In a relatively competitive final, Roberts prevailed over Junior Byron Cox, three games to two. Roberts, after losing the first game, rallied back to take games two and three, before Byron Cox squared the proceedings in game four. The cool and collected Roberts won 8/11, 11/8, 11/7, 9/11, 11/9. Roberts, in the quarter- final round, beat Michael John, 11/6, 11/7, then silenced Mark Charles, 11/9, 11/2 in the semi-finals. Meanwhile, en route to the championships match, Byron Cox saw off Murray Bullock 11/7, 11/7 in the quarter-final and overcame Oral Roberts 9/11, 13/11, 11/9. Charles emerged as the third place winner. Collin Cambridge and Davon Cato were the other competitors who were involved in the singles showdown. 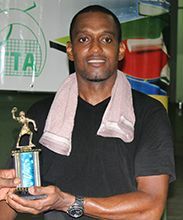 When the tournament was hosted in 2013, Alonzo Primus emerged the winner.